I have been working with clients and athletes for years on hydration. I help them learn the signs of dehydration that apply to them. Not everyone is the same in their symptoms, but once you know your signs, you realize that hydration is essential to finishing a long workout, and finishing strong at a race. I worked with Steve Stearns of Outside Health and Fitness. He has many podcasts on his page which are really interesting. I was thrilled when he asked me to be on the show to talk about hydration. Here is the link to the podcast. 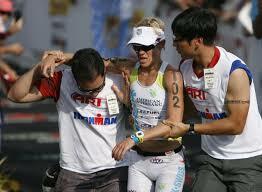 You don’t want to be carried away limp after the race from dehydration! We reviewed calories per hour, and they were not cramming in too many calories if we removed that Nutrageous bar. But client switched half way from their drink, to Gatorade which was easy to buy on the road at a convenience store. Trouble is, that was not going to be on the course and it wasn’t helping his hydration either. It was hurting it. We suggested they take their current powder with them to refill bottles for the remainder of the training ride. After asking about their symptoms, it was apparent to me, his cramping were a direct result of the switch to Gatorade which had no magnesium or calcium. Low magnesium is usually the culprit for muscle cramping not sodium or potassium loss. A week later, we check in and the muscle cramps are gone! phew! Client did take their own hydration blend so we now know that works! Now we have to still deal with the fatigue and just feeling blah. This could be either dehydration, or it could be low fuel. This is where the customized approach to sports nutrition really helps. It is not about me saying it has to be this way – every one does it that way. It is about listening to the client and understanding where the issues lie. When did the issues start? Did you also experience X, Y or Z? Now we are past the cramping and the high heart rate. Now we just need to optimize breakfast beforehand, try drinking more frequently from the beginning of the bike (rather than waiting til hour 2 and playing catch up), and trying a few different options of gels, shot blocks and other fueling to get the right balance. We are also trying to get a step ahead of the hydration with pre-loading electrolytes the day before long training sessions, and changing the electrolyte profile as we may need more sodium in the mix. The other electrolytes are already in good supply. Some athletes need in excess of 600 mg per hour of sodium. This is based on sweat rates and analyzing what client is already using, paired with symptoms. We are trying to electrolyte replenish during the week with foods, too as it might be a depletion starting with the speed sessions during the week, which depress the stores just before the long weekend sessions. Hydration is essential, but it is also a process. Dialing in what works for each client usually takes a good 3-5 sessions to get it just right. Then the perfect performance can be had because we eliminated nutrition and hydration issues. If you know an endurance athlete, half or full Ironman, marathon or ultra runner or cyclist, who is having GI distress, fatigue, nausea, cramping or other issues keeping them from finishing strong, remind them that hydration is essential to their performance. 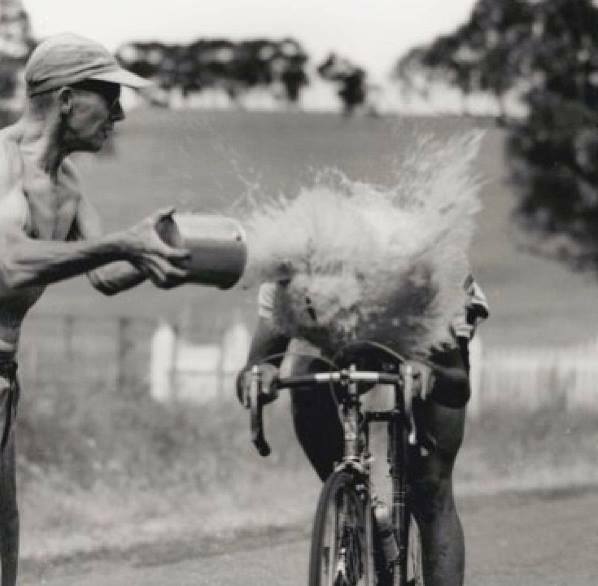 Even 1% dehydration can mean a 10-15% drop in performance. If they at least listen to the podcast, I will be happy. But if they want expert advice on how to dial in their hydration, have them contact me, Joanna at Nutrition in Motion. Or follow me on Facebook. Not only have I experienced dehydration first hand, I know how to work with athletes current programs to optimize their plan for race day.